SKU: RF040. 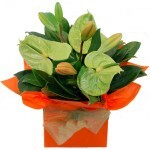 Category: Anniversary, Arrangements, Baby, Birthday, Bouquets, Christmas, Congratulations, Corporate, For Her, Functions & Events, Get Well, Love & Romance, Mother's Day, Orchids, Sympathy, Thankyou, Vases, Winter. 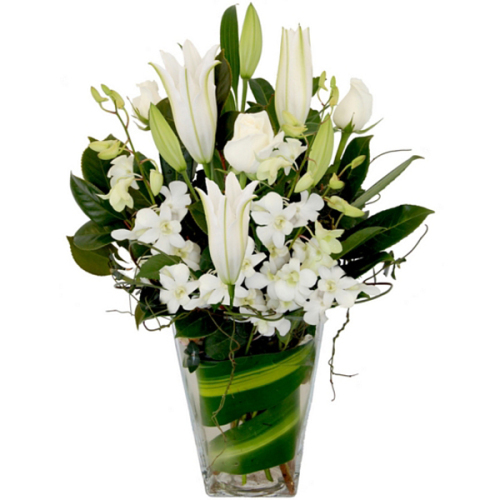 Tags: glass vase, white flowers. 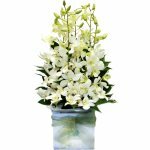 A classic and elegant combination of all white flowers with lush green foliage, presented in a glass vase. 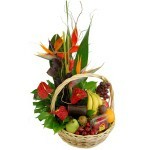 Note: This arrangement contains scented lilies.